The seven individual hangings known as "The Unicorn Tapestries," are among the most beautiful and complex works of art from the late Middle Ages that survive. Luxuriously woven in fine wool and silk with silver and gilded threads, the tapestries vividly depict scenes associated with a hunt for the elusive, magical unicorn. 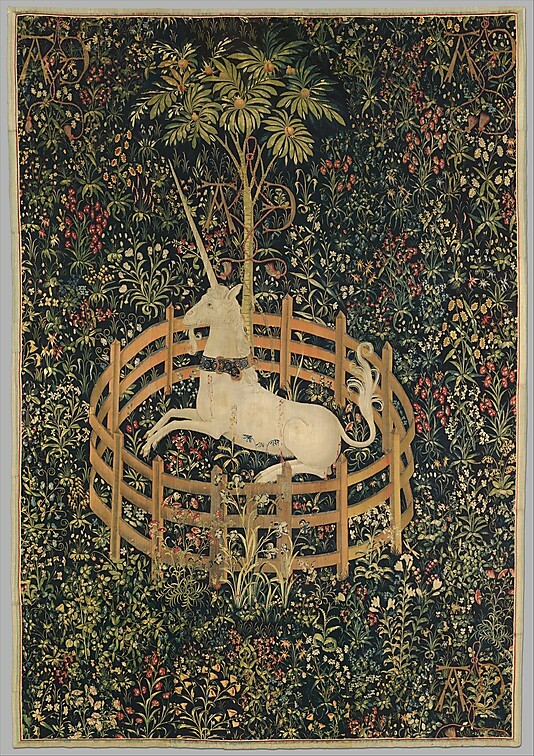 "The Unicorn in Captivity" may have been created as a single image rather than part of a series. In this instance, the unicorn probably represents the beloved tamed. He is tethered to a tree and constrained by a fence, but the chain is not secure and the fence is low enough to leap over: The unicorn could escape if he wished. Clearly, however, his confinement is a happy one, to which the ripe, seed-laden pomegranates in the tree—a medieval symbol of fertility and marriage—testify. The red stains on his flank do not appear to be blood, as there are no visible wounds like those in the hunting series; rather, they represent juice dripping from bursting pomegranates above. Many of the other plants represented here, such as wild orchid, bistort, and thistle, echo this theme of marriage and procreation: they were acclaimed in the Middle Ages as fertility aids for both men and women. Even the little frog, nestled among the violets at the lower right, was cited by medieval writers for its noisy mating. We dont have a Goodwill here but the Humane Society runs a second hand store. People donate to the Human Society and they sell stuff to support the animals. 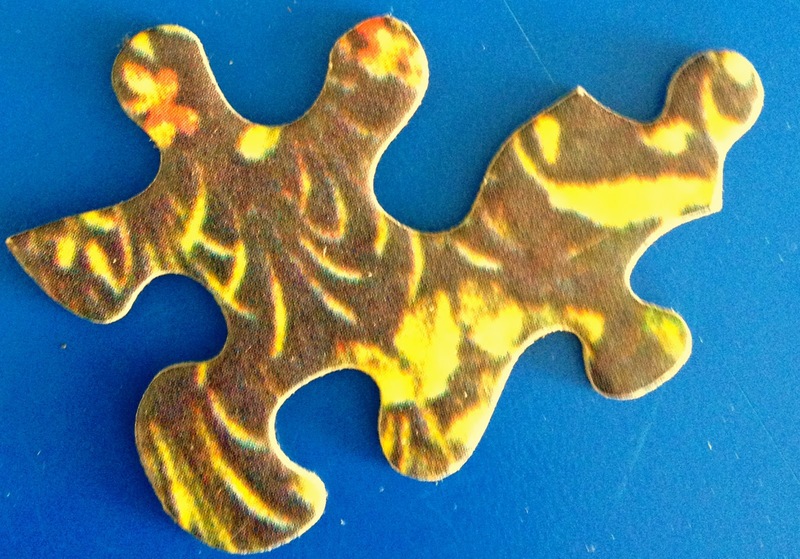 We have bought a LOT of puzzles from them for $2 and yesterday I was browsing to see the new puzzles and I came across one that I passed on previously. 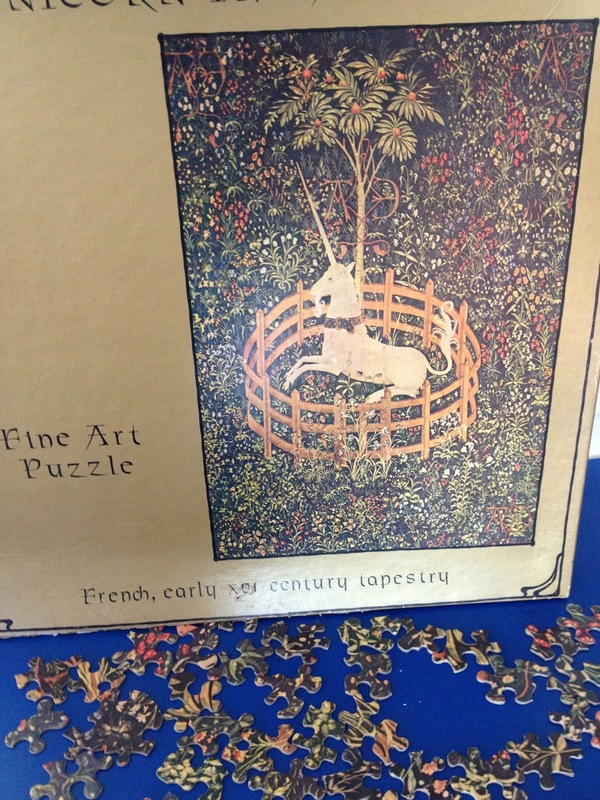 The Unicorn in Captivity - 500+pc from Gallins Gallery, New York 10001. If you remember, we have a friend doing some soft time for a tax issue down here, and she truly is a beautiful person; A unicorn in captivity. We recently visited her and took her a puzzle (amazingly, they allowed it), which really helped her spirits. I realized this had to be her next puzzle! I paid $1 ('cause it was half price day) and decided on the way home, to assemble it and write her a letter on the back of the puzzle. 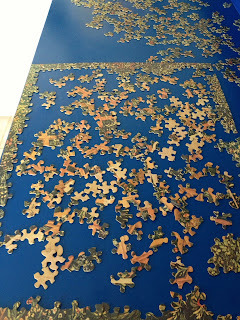 Well, its a beautiful puzzle, the pieces are beautifully cut and fit well, the colors are great for what is surely a 20-30 year old puzzle. I will actually be sad to let this one go. 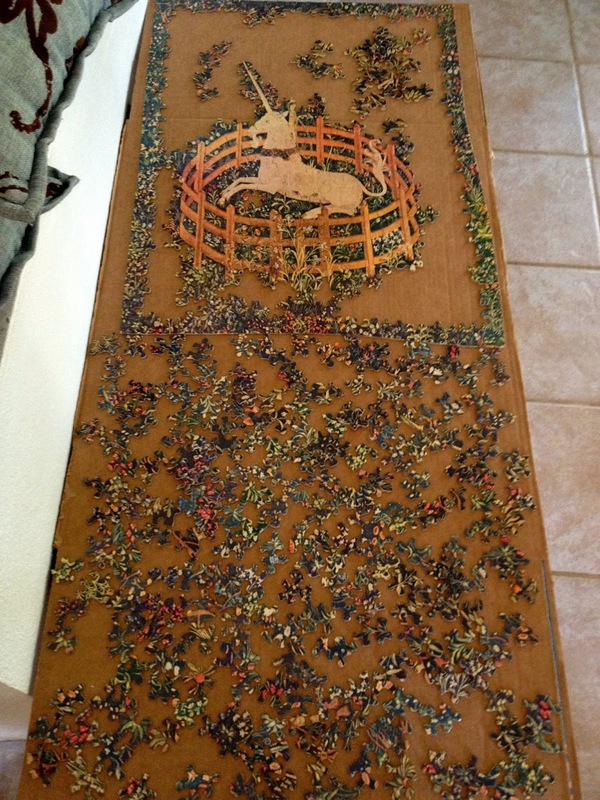 I love puzzles with pieces like this. I am going to wish very hard for a large format puzzle with shapes like this (5000 or more pieces). I imagine the trouble lies in the dies needed to create such monsters. Border almost done and unicorn and fence pieces sorted out. 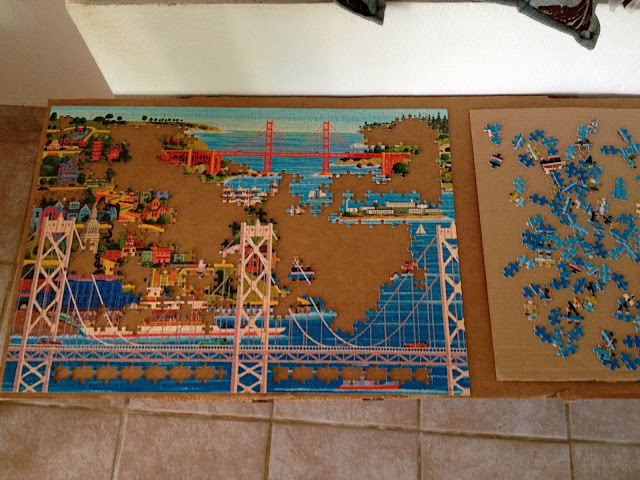 Bridge of San Francsico - 1000pc is coming along nicely. M did the upper half, I did the border and the Bay Bridge. We should finish both of these puzzle tonight.